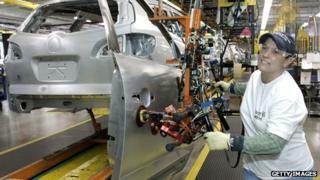 The US economy added an extra 163,000 jobs in July, according to official figures, beating analysts' forecasts. However, the unemployment rate rose from 8.2% to 8.3% last month, as more people re-entered the workforce but failed to find a job. The US Department of Labor also said 6,000 fewer jobs were created in May and June than first estimated. The US economy has to generate 100,000 new jobs a month just to stand still, according to the Federal Reserve. The total number of unemployed people was 12.8 million last month, unchanged from June. Private sector firms hired an extra 172,000 staff, which more than offset the 9,000 fall in government payrolls. President Obama's basic argument is simple. Without his actions, including spending to stimulate and save industries, the economy would have gone down the drain. The president claims what is needed is more Obama. Notably "an extension of middle-class tax cuts" and a Congress that will pass his American Jobs Act, to help public sector hiring. Even if he is absolutely right, as a campaigning position it is pretty lame. "It could have been worse" is not a great rallying cry. While blaming Congress may be popular, it is peculiar as an argument for re-election. If Obama wins he is likely to face an even more intransigent bunch on Capitol Hill. But even though America may feel let down by Mr Obama, it has yet to be convinced by Mr Romney. This election really is wide open. The figures were better than most economists had forecast. "We are not seeing large-scale layoffs, so job destruction is pretty limited," said Scott Brown, chief economist at Raymond James & Associates. There were also signs that Americans were optimistic about finding a job. The number of discouraged workers - people not looking for work because they believe there are no jobs - fell 267,000 to 852,000. The number of involuntary part-time workers, those whose hours have been cut back or who could not find full-time jobs, was unchanged at 8.2 million. Candidates for the November presidential election have been watching the jobs reports closely, as the economy remains a top voter concern. President Barack Obama said: "Let's acknowledge, we've still got too many folks out of work. We've got more work to do on their behalf." The White House's chair of economic advisers, Alan Krueger, said: "Any increase in the unemployment rate is unwelcome but we do see an economy that is continuing to add jobs." He added that the private sector had added jobs for 29 months in a row, for a total of 4.5 million. But Republican presidential candidate Mitt Romney described the slight increase in US unemployment to 8.3% from 8.2% last month as "a hammer blow to struggling middle-class families", as he said his jobs plan would add 12 million new jobs by the end of his first term. To understand why more jobs didn't lower the unemployment rate, you have to look at how the figures are compiled. The US Department of Labor uses two surveys to measure employment. One survey asks companies and government agencies how many staff they employed during the month. In July, firms said they were hiring. This is the measure economists tend to focus on most. The unemployment rate comes from a survey of households. Government employees ask the adults in each household if they are working. Those who don't are asked if they're looking for a job. Last month, more people said they were unemployed. Less people have given up looking for a job, but that number is still high, revealing the continuing struggle many Americans face finding work. "You know this," Mr Romney said. "These numbers are not just statistics. These are real people, really suffering, having a hard time." Mr Romney went on to criticise the president's policies, saying "This is an extraordinary record of failure." Last week, official data showed the US economy grew at an annual rate of 1.5% in the second three months of the year, that was slower than the 2% pace at the start of 2012. On Wednesday, the Federal Reserve said its programme to reduce long-term borrowing costs for firms and households would continue for the rest of the year. Under Operation Twist, the Fed buys long-term bonds from retail lenders and swaps them for shorter-term bonds. But it disappointed some investors by not announcing any fresh measures to stimulate economic growth. The Fed has kept base interest rates at close to zero for nearly four years and pumped $2.3 trillion into the economy.